Grise — Flute and piano. Fauré composed this haunting Pavane, op. 50, in late summer 1887 at his home in the Paris suburbs. 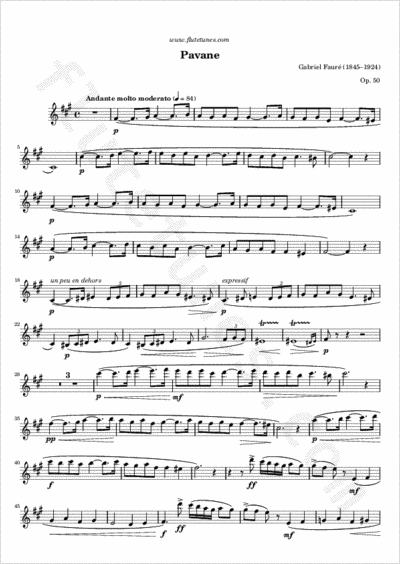 Obtaining its rhythm from the slow processional Spanish court dance of the same name, the Pavane ebbs and flows from a series of harmonic and melodic climaxes, conjuring a cool Belle Époque elegance. At first Fauré envisaged a purely orchestral work to be played at a series of light summer concerts. But after Fauré opted to dedicate the work to his patron, Elisabeth, comtesse Greffulhe, he felt compelled to stage a grander affair and thus he added an invisible chorus to accompany the orchestra (with additional allowance for dancers). The choral lyrics were based on some inconsequential verses, à la Verlaine, on the romantic helplessness of man, which had been contributed by the Countess' cousin, Robert de Montesquiou-Fezensac. The little work grew immensely popular, with and without chorus, and Fauré's example would soon be imitated by his pupils, who went on to write pavanes of their own: Ravel's Pavane pour une infante défunte and Debussy's “Passepied” from the Suite bergamasque.